The new Hon. Minister of State for Environment, His Excellency Alhaji Ibrahim Usman Jibril, visited IITA this week to familiarize himself with IITA and seek future collaboration. The Minister of State for Environment and his officials in a group photo with IITA staff. 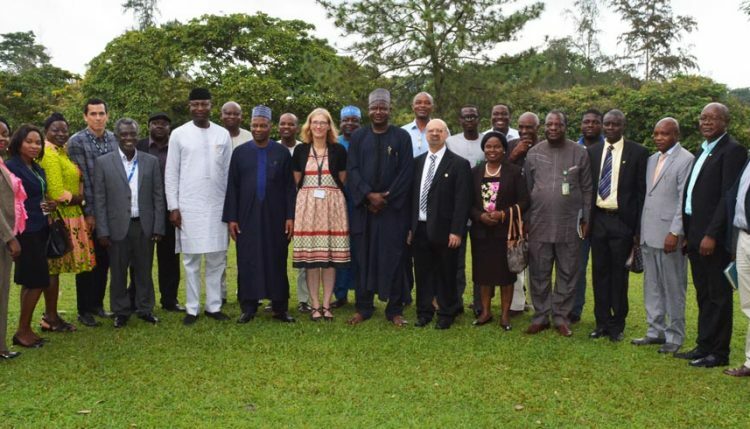 The minister was accompanied by the Permanent Secretary to the Ministry of Environment, Dr Shehu Ahmed, a former IITA board member and immediate past Permanent Secretary of the Federal Ministry of Agriculture and Rural Development; the Executive Director of the Forest Research Institute of Nigeria (FRIN), Dr Adepoju Adeshola, and a host of other officials. Deputy Director General for Partnerships for Delivery Kenton Dashiell welcomed the minister and his party to IITA, after which Robert Asiedu, Director, West Africa, explained about some of IITA’s ongoing efforts and activities in Nigeria. The Minister also brought up the issue of biotechnology and genetically modified organisms (GMOs). He said the Ministry is neutral and looking at things objectively and scientifically. He said there is a need to let people know what is happening.